For the longest time, the angel-eyes halo ring has been considered as a signature style for BMW and BMW only. Now these LED halo rings are no longer an exclusive for BMW because at iJDMTOY, we have introduced a new product line: LED halo ring package deals for over 50 popular cars. We recommend these LED halo rings to be installed by a professional due to the amount of work required. 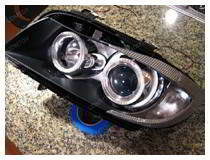 These LED halo rings will require the headlight assembly to be opened and re-sealed. We do not take any responsibility for any damage or labor that is involved with the installation of this product. These rings are to be mounted using either double-sided tape or silicone adhesive glue. We recommend using these with aftermarket or OEM projector housings to allow these to be seated correctly. 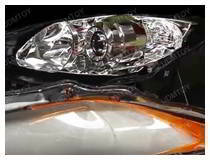 Modifications to the headlight assembly may be required to fit these, depending on the application. Please keep in mind that any modification to the LED ring such as painting, gluing, or cutting will void the warranty. Please make sure that you test the lights prior to installing, so to ensure they are working before proceeding with any type of work. The LED halo rings are designed to fit either right around the projector lens or onto the shroud. The proper ring sizes are provided by THE SHOP.